Most schools are anticipating the arrival of warm weather, but the MAAC men’s and women’s basketball teams do not have time to think about the weather and their vacation plans. 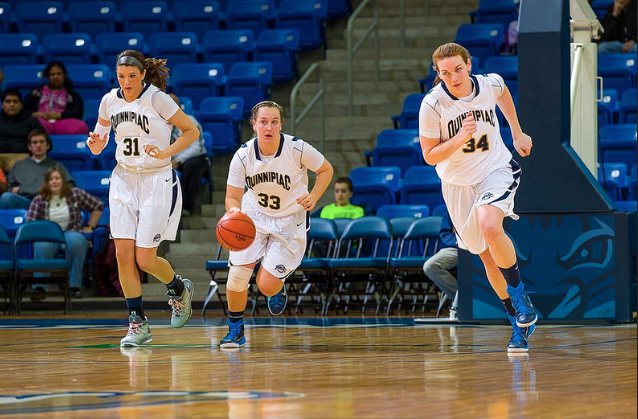 Instead, they are headed to Albany, New York for the 2015 MAAC Basketball Championships. The No. 2 Marist Red Foxes have represented the MAAC in the women’s NCAA tournament for the last nine seasons, but the No. 1 Quinnipiac Bobcats are looking for revenge. They went an undefeated 20-0 in MAAC play this year, and are seeking redemption for their 70-66 loss to Marist in the championship game last year. The No. 3 Fairfield Stags, No. 4 Iona Gaels, and No. 5 Siena Saints also get a bye through the first round. This year’s tournament will begin with a game between the No. 8 Canisius Golden Griffins (10-19, 8-12 MAAC) and the No. 9 Monmouth Hawks (12-17, 8-12 MAAC). Monmouth defeated Canisius twice this season, but their overall numbers point to an even matchup. Both sides are relatively similar in their scoring and turnover margins. One of the big differences though is that Monmouth shoots the three-pointer a lot more than Canisius. Canisius does, however, shoot the highest percentage from downtown in the conference. The winner of this game will be playing Quinnipiac next round. The next game is between No. 7 Rider Broncos (11-19, 8-12 MAAC) and No. 10 Saint Peter’s Peacocks (4-25, 4-16 MAAC). All four of the Peacocks’ wins came in conference play, but none of them were against Rider, who they lost twice to. Rider has lost three in a row though, and the Peacocks picked up a big 66-58 win against No. 2 Marist last week. Marist is slotted to play the winner of this game in the quarterfinals. No. 6 Niagara Purple Eagles (13-16, 9-11 MAAC) will play No. 11 Manhattan Jaspers (3-26, 2-18 MAAC) at 1:30 today for the last first-round game on the women’s side. Niagara blew out the Jaspers 64-36 in December, but they only won by seven in the second meeting between the two teams. Niagara is second in the conference in three-point shooting, and Manhattan allowed the most threes in the MAAC this year. Whichever team comes out the victor will be playing No. 3 Fairfield in the next round. The championship game has been a matchup between Iona and Manhattan for the past two years. Manhattan is the defending champ, and the rest of the conference will look to put an end to their reign. No. 3 Manhattan has a first-round bye for the fourth straight year, while No. 1 Iona will get a straight shot to the quarterfinals for the sixth straight year. No. 2 Rider, No. 4 Monmouth and No. 5 Canisius will be joining them in getting a bye, leaving six teams to duke it out in the first round. The No. 8 Siena Saints (10-19, 7-13 MAAC) saw the No. 9 Niagara Purple Eagles (8-21, 7-13 MAAC) twice this season and beat them both times. Siena beat Niagara 79-69 at home and again 74-70 on the road. The Saints outscore the Purple Eagles by about five points per game, but they also surrender more points to the opposing team. And even though Niagara lost twice to Siena in the regular season, they are currently riding a four-game win streak, while Siena is stuck in a four-game skid. This game is first of this year’s tournament on the men’s side, and at 5 p.m. today these teams will square off to determine who will play top-seeded Iona in the quarterfinals. The No. 10 Fairfield Stags (7-23, 5-15 MAAC) split regular season games with their first-round matchup, the No. 7 Saint Peter’s Peacocks (14-17, 8-12 MAAC). But the Stags have their work cut out for them tonight when they play Saint Peter’s at 7 p.m. Fairfield has the lowest scoring offense in the MAAC, while Saint Peter’s allows the least amount of points. The winner will go on to play No. 2 Rider in the quarterfinals; a team that both Saint Peter’s and Fairfield lost to twice this year. The last first-round game will be played at 9 p.m. between No. 6 Quinnipiac Bobcats (15-14, 9-11 MAAC) and No. 11 Marist Red Foxes (6-24, 5-15 MAAC). Quinnipiac beat Marist twice in January, but has fallen off since then, losing four of their last five contests. However they led the NCAA in rebounding for the third straight season under head coach Tom Moore. 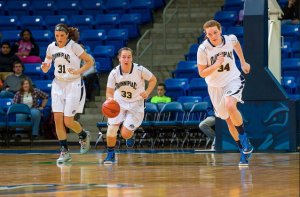 The Bobcats also have the second highest scoring margin in the MAAC behind Iona, while Marist has the lowest margin. The winner of this game will advance to play defending champion Manhattan in the quarterfinals.